Article on the Mustang Trail Race reposted from Amuse Magazine. Sometimes the further you get from civilisation, the more civilised life seems to get. To reach the starting point of Trail Running Nepal’s annual Mustang Trail Race, a bus weaves its way up towards one of the country’s most isolated and untouched regions. Trundling out from Kathmandu bound for Pokhara, we pass through clouds of dust, burning rubbish, streams strewn with trash and all the other obvious outward signs of a developing country. But as we leave the main roads behind and weave our way up a Himalayan valley towards Beni, life starts to slow down. By the time we get to Jomsom in Lower Mustang, the 21st Century is behind us, with mules and yaks trotting down the main cobblestone road and traditional apple orchards stretching up the terraced slopes. 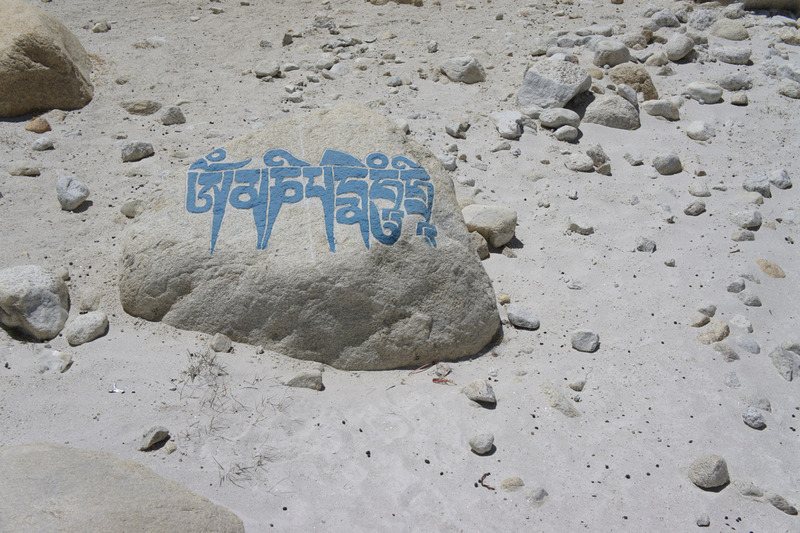 Once known as the Kingdom of Lo, this part of the Himalayas was until recently completely closed to the outside world. Nepal itself only opened up to foreign visitors in 1946, Mustang was a restricted region until 1992 and it remained a separate Kingdom as late as 2008. This isolation, the area’s seeming desolation and a hefty visitors’ trekking fee has kept its valleys, rivers and trails relatively empty compared to other parts of the country, where trekkers can trudge in endless lines along the more popular routes around Everest and Annapurna. 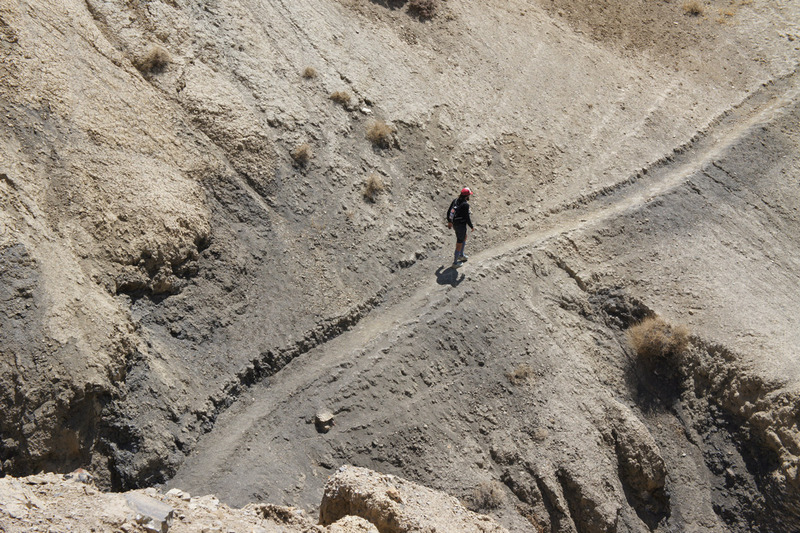 The Mustang Trail Race is one of the Himalaya’s most challenging and adventurous running races – a 160km dash through the arid but spectacular landscapes of Mustang. Over eight days, the run will take us up and down almost 11,000 metres – more than the height of Everest. Beyond the altitude, the climbs and the steep descents, there’s a blazing sun, extremely dry air and fierce anabatic winds to contend with. On the flip side, all our bags are taken ahead of us each day, we’re travelling with our own chef and every evening meal begins with a steaming white towel – some luxury amid the exertion. We start from Jomsom with an acclimatisation hike that takes us 934 metres up and 21 kilometres over a mountain pass and into another world. We pass through a small village where an archery competition is underway and loud gambling game unfolds in the corner of a whitewashed house where we’re taking tea. After catching our breath, we trace the route of the Kali Gandaki, a river which cuts through the Himalayas (forming the world’s deepest gorge) before joining up with the Ganges far below. The next day the race begins for real, with an early morning start that sees just over 20 runners rushing through the picturesque town of Kagbeni, which grew rich by taxing passing caravans bringing salt from Tibet. When we hit our first hill, I’m breathing so hard it’s impossible even to sip water and a mild panic sets in. We scramble up a rocky embankment and an uphill road winds on forever. This is just stage one. The run takes us past terraced barley fields, ultra cold streams and ancient villages. 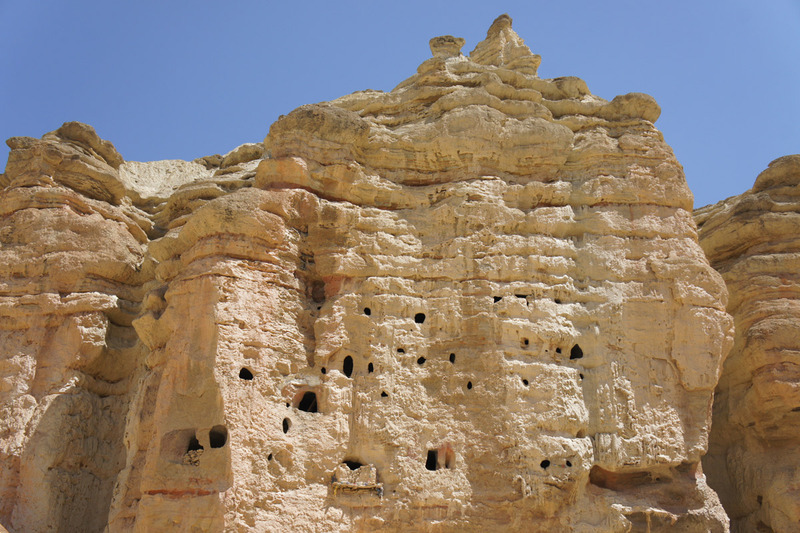 As we climb the final, brutal hill towards our first night’s stop at Tsaile, it feels like we’ve truly arrived in Upper Mustang. Despite the beauty, life here is hard. Firewood is scarce, and what wood there is is stacked on top of homes as a status symbol. Many of the villages’ youth have left for work and school in other parts of the country, leaving a mix of children and the elderly behind. Hospitals and healthcare facilities are thinly spread, and many homes still have mud floors. 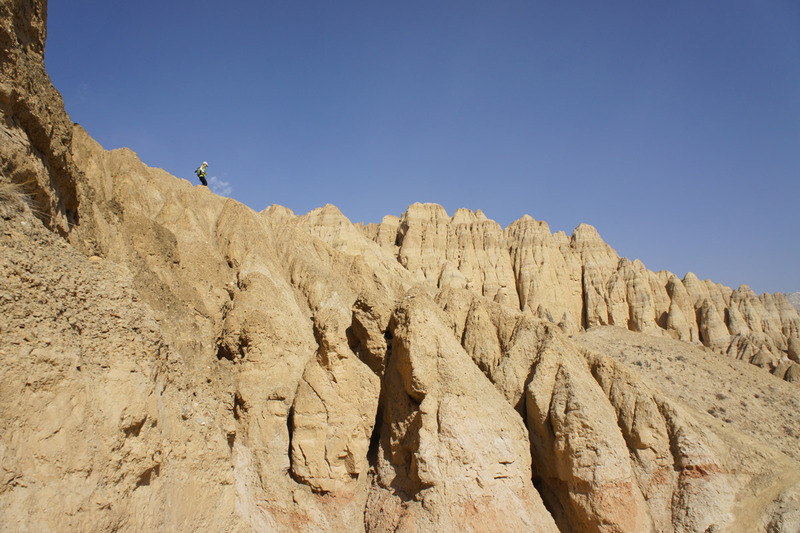 Beyond the obvious backdrop of some of world’s most beautiful mountains, Mustang is full of well-hidden surprises. We stop at the Chungsi cave temple where Padmasambhava – an 8th century Buddhist master widely known as ‘the second Buddha’ – stopped to meditate. 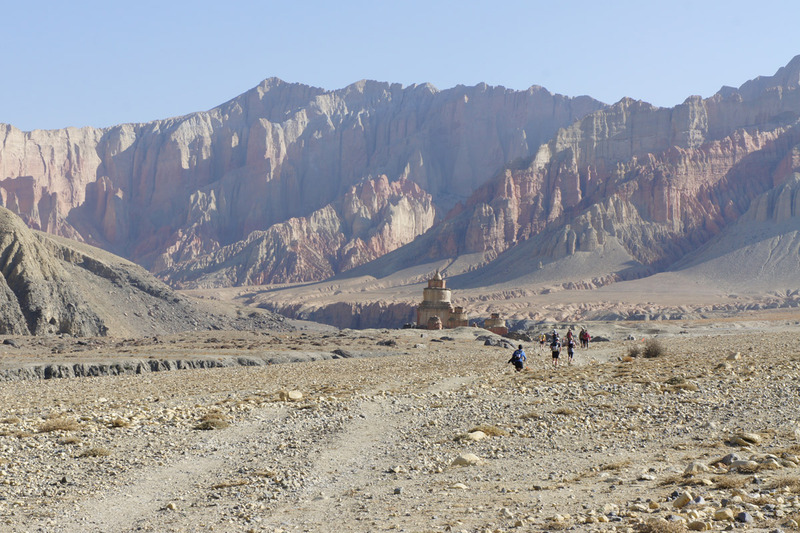 We run past the striking red cliffs of Drakmar and later on to Lo Mantang, the ancient walled capital built in the 1300s and little changed since. Rising early we watch the moon set over the mountains and pick out planets in the morning sky. 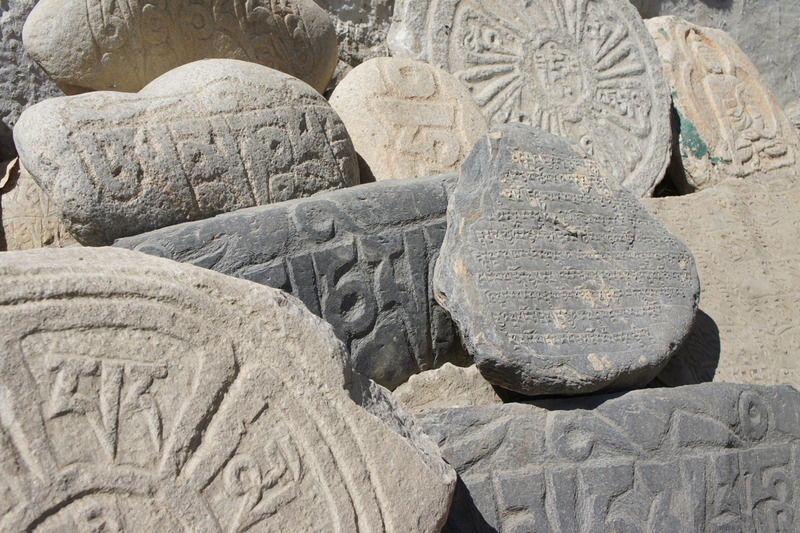 We climb to Konchok Linga, a recently-unearthed cave with exquisite Tibetan Buddhist art work. As the kilometres add up, so do the wonders. We trek up to Luri Gompa cave one morning to shine our headlights on medieval depictions of the ‘unorthodox’ Buddhist Masters. There are river valleys with prehistoric ammonite fossils, distinctive black stones that Hindus believe are the manifestation of Vishnu, who disappears if the rocks are broken open. It’s a physically tough nine days of racing, but the Himalayan peaks of Annapurna and Dhaulgiri mean we wish it wasn’t over. 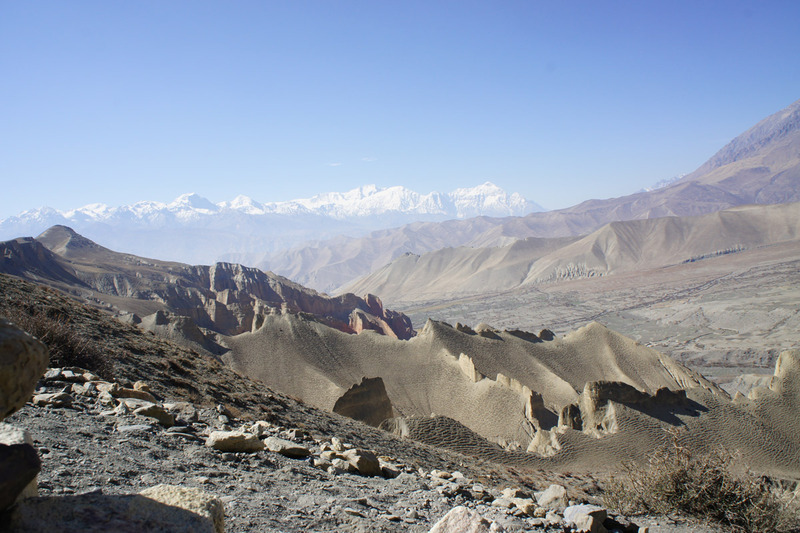 After a final willpower-testing ascent that takes us up another thousand metres, the last leg is an exhilarating run down towards the town of Muktinath, which lies on both a Hindu pilgrimage route and the popular Annapurna trekking circuit. Crossing a suspension bridge brings us back into the modern world with a jolt, smoothed over by our first beer in weeks, yak burgers for the carnivores and furious social media activity all round. Trail Running Nepal’s next big race is the even-tougher Manaslu Trail Race starts 5 November 2016. The next Mustang Trail Race takes place in April 2017.